The soundtrack was so annoying that I couldn't finish the movie. The most reasonable and lyrical film. I thought the the original Dunkirk released in 1958 with John Mills and Richard Attenborough was much, much superior and portrayed both the breadth and depth of what was both a disaster and a triumph infinitely better than this. Great movie. Very intense. Christopher Nolan at his best! I found it to be severely lacking, Sad to say the original footage from the day outstrips this movie. Not worth watching for the price they want. Missed the mark on many levels disappointing after all the hype. This was a sad attempt to be like saving private ryan. This was not a good movie. When the Brit plane with no working prop spent 10 minutes gliding through the air and was able to shoot down a fully functional German aircraft...well, nuff said. Don't be expecting your standard war epic. There are three main story lines that precede at different paces, depending upon the location (on the beach, on the water, in the air) of the characters involved. Superb story-telling, incredibly intense. This was a complete waste of time and money.Disjointed with no story line at least none that I could find. Well made. Not your "Hollywood" usual crap. Very close to the real thing. This movie was just bad! No real plot and it just skipped around allot. Doesn't real explain what was going on much. It was a real story but not well delivered. This movie was okay, even though a little hard to follow in the beginning. Not factual, not the complete story! No history. Little dialogue. Simply jumps from scene to scene of noise and chaos. Possibly Hollywood's idea of modern art. Absolutely amazing ... for a movie with little dialogue the time went so fast and I was mesmerized by how the movie was chronicled from day 1 to the end. Loved it!!! Total gratitude for those willing to risk the danger of rescue and what it took to save those men. I thoroughly enjoyed this movie as a female and lover of history. 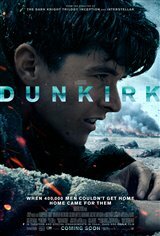 This film missed the most significant aspect of the Dunkirk evacuation: the mobilization by ordinary Englishman of everything that could float in order to get the troops off the beach. Some attempt was made at this in the film, but it was by no means the most important. In fact, I'm not sure what was important in this film. All I could think of, after the movie had ended, was what happened to all the small craft? If you watch the movie there were no more than 20 of them. Young people leaving the theatre were repeating the same statement "what's the big deal?". To get a better idea of what I'm talking about, I suggest viewing the Academy award winning film Mrs. Miniver . This story is about the rescue 330,000 men. Do the math, can you imagine how many leisure crafts that takes. well then it seems someone is unable to. My family and I couldn't understand the words and worse, the movie switched wildly around with no cohesive context. In addition, the soundtrack was far too loud and not adjusted for speech level of the actors. Every time something was said by the actors the soundtrack remained at unedited loud levels and played over the speech audio. My wife and I asked each other constantly,"what did he say? " This is the worst job of editing a movie I have ever seen. We finally walked out on it because it was an unpleasant "battle" to interpret the story line. From what I have read, it is very realistic. I definitely thought it was an interesting cinematic experience. Showed the history of the Battle of Dunkirk as best could be done. Great movie depicting the history of those who fought for our freedom!